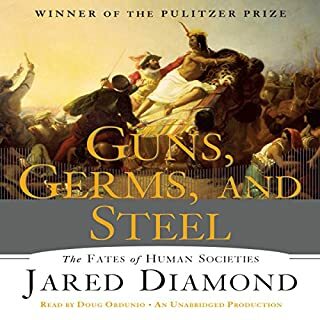 As in Guns, Germs, and Steel, Diamond weaves an all-encompassing global thesis through a series of fascinating historical-cultural narratives. Moving from the Polynesian cultures on Easter Island to the flourishing American civilizations of the Anasazi and the Maya and finally to the doomed Viking colony on Greenland, Diamond traces the fundamental pattern of catastrophe. Environmental damage, climate change, rapid population growth, and unwise political choices were all factors in the demise of these societies, but other societies found solutions and persisted. Similar problems face us today and have already brought disaster to Rwanda and Haiti, even as China and Australia are trying to cope in innovative ways. Despite our own society's apparently inexhaustible wealth and unrivaled political power, ominous warning signs have begun to emerge even in ecologically robust areas like Montana. This book is clearly recognizable as coming from the same fine intellect as "Guns, Germs and Steel." However, it suffers from two problems unique to the audiobook format. The first problem is that the logic suffers somewhat from the abridgement. Even worse, as a scientist I found it very irritating not to be able to consult the figures, diagrams, and references that come with the paper copy of the book. I definitely recommend buying the hardcopy instead of the audiobook. 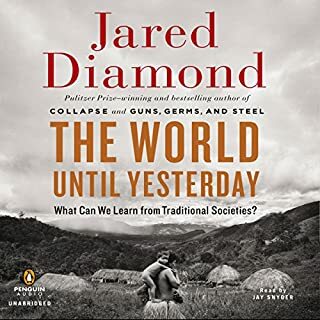 However, the points that Jared Diamond makes in this book are so interesting and important, and are so well-illustrated with anecdotes about various cultures, that I have to say: if the audiobook version is the only way that you will read this book, than by all means buy it. 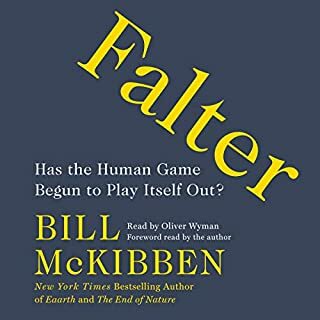 I would most strongly suggest that to get an *idea* of how petrifying the state of the Earth is in the eyes and fact presentation of the author, skip to the last 45 minutes of the book-- *first*-- which cuts to his Twelve key points that are common to geat society's death (throughout history) and signals thereof. As the US (us). There is no way to read this book and think that we are anything more than the Aztecs on their last hair. While this is a book that I believe *must* be read by any American with a conscience (or a book similar hererto), I come away with one conclusion: The United States, in the author's eyes, is in the proverbial final dance of re-arranging the chairs on the Titanic. While the author concludes after reeling off 8 hours of depressing fact after mortifying horrible fact, and then another sign that we are all [Going Down], he has the NERVE to conclude in a wistful way that "[we still have time to change the course of human events]," a conclusion that rings hollow and disingeneous after his mountains of terrifying FACTS and cogent arguments. A truly horrifying book. But if you can "handle the truth," please know that I recommend it most highly. Well-written and well-read. Got a little "windy" in the second half. Would prefer to have had a non-abridged version. The examples the author gives seem to be well-researched. As others have mentioned, this is the best version of the Easter Island story I have ever seen, and it sounds dead on. The author does seem to be trying to draw some parallels in all of the materials to our modern situation, but I am not sure that really works for me. I suppose that leaders at any given time in history can have their own agendas that do not reflect the long term well-being of their countries, or that any society can fool itself into thinking that the way things are now, are the way things will continue, which seems like a bad bet, for instance, when the society is over-exploiting the environment while they are making those assumptions. But those seem like fairly trite thoughts. I would prefer fewer overall conclusions and more details on societies that actually collapsed, which is an absolutely fascinating subject as presentd in this book. 1491, for instance, has some overlap in topics, and seems better done, with essentially the same "lessons," if the listener wants to think in those terms. Jared Diamond is a good writer and he makes subjects that we learned to dread in school interesting and appealing. Collapse is right in line with Guns, Germs, and Steel in terms of information quality and writing (comparing unabridged GG&S audio to abridged Collapse audio). Diamond's presentation of historical information and analysis is second-to-none, and best of all, its accessible to people who aren't history buffs or anthropology majors. 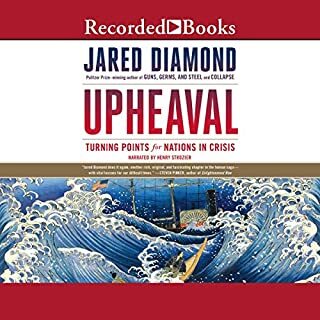 Diamond explains what lead to the internal collapse of societies of our past, and how their problems can be seen at the edges of today's modern societies. Present-day issues are examined not with pessimism, but with guarded optimism, with the good and bad brought to the forefront. The delivery of the audio version is good, better than the audio GG&S. Some spoken sentences and paragraphs are noticeably inserted after the original recording and the speaker clearly sounds different for these inserts, although this does not detract very much from the overall program. The speaker's voice is deep, clear, and well paced. Short well-chosen music clips denote chapter transitions. I will definitely repurchase this title when it is released unabridged. The message in this book is critical for our modern society. The author looks objectively at the dangers that face us. His reserach is exhaustive, and his conclusions are credible and interesting. However, the delivery was painful. I usually can't turn a book off, and I had to force myself to listen to this one. I needed to make sure I never listened when I was tired, and I had to take it in manageable amounts. I don't know if the reading didn't suit me, or the writing was not great for audio book. I do know that the book was worth listening to, but also difficult to make it through. It was like painting my house. I am glad I did it, but it wasn't always fun in the process. This (audio)book is a detailed analysis of why societies succeed or fail. It has an environmental slant to it since throughout much of human history societies were tied intimately to their immediate surroundings through agriculture. Not surprisingly, a topic as complex as societal collapse can't be boiled down to "Collapse for Dummies"---a lot of evidence needs to be described and analyzed, and a set of multiple causative factors explained. This makes the book very involved, which is nice, because most popular science books are fluffy and boring. I'm astounded by reviewers who complain that he only presents societies that failed (he presents several that succeeded); that he claims that environmental causes are the main factor in collapse (he does not claim this---in fact, he says specifically that he is not saying that! ); that he is an enviro-apocalyptic (he does not claim we are doomed); or that he is simply spewing some sort of liberal mantra of envrionmentalism. I figure that reviewers who claim such things have neither read nor listened to the book. I think that this particular book is one where the abridgement is actually a good thing; Diamond has the academic's habit of presenting the outline of an argument that he will give you eventually, presenting the argument, then presenting a presentation of the argument, then presenting a summary of the presentation of the argument. The abridgement is good because it cuts out at least two steps here. The narrator is fine, and sounds somewhat similar to the author. Diamond is indeed a good storyteller, but the content of the book was far more insular than I expected. The text could be more aptly titled: "Environmental Collapses of Society: Then & Now". 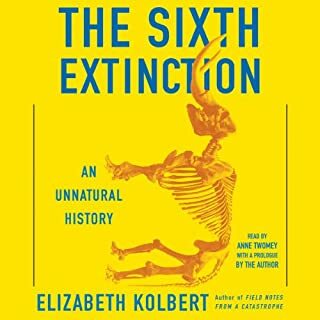 This is a book about how misuse of environmental resources have led to the collapse of many past societies and how it threatens to do the same to our own society. The two points that I found unsatisfactorily address were: 1) How applicable are past lessons about resource use and reliance from Easter Island and Viking Greenland to 1st world societies today? 2) What factors outside of our environmental reliance on dwindling resources may also contribute to 1st-world collapse in the modern age? The first question was dealt with quickly only via a straw man argument, while the later is not touched on at all. That said, the book does provide interesting cultural history lessons, and its applicability to the third world today (as evidenced in the Hati and Rwanda examples) is compelling. Diamond also provides a interesting look at what economic factors contribute to certain industries being more or less environmentally responsible. This section was compelling, but too small a portion of the whole text in my opinion. If you are looking for a book on the management of natural resources, or a look at several interesting historical cultures, I think you will enjoy this book. If, like me, you are looking for a more pragmatic discussion of the large problems threatening society today, you may want to pass. I enjoyed the example of Hispanola, the deforested side of Haiti v. the lush side of Dominican Republic. Sharp and precise example of Rwanda, coworkers killing each other, students/teachers also participated in genocide. Well told and balanced. 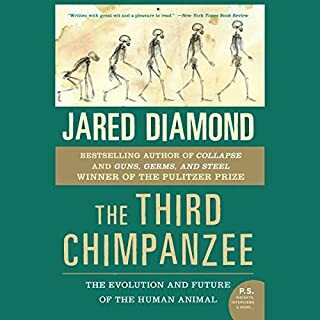 Instead of choosing to explain historical and scientific principles through theories, Jared Diamond chooses to explain his theories through real-life examples, focusing on the practical details. 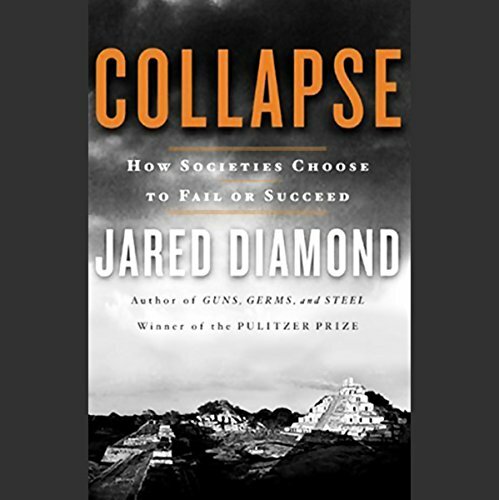 Collapse is a mixture of brief accounts covering societies from the Mayans to the Vikings and their reasons for failure. The book focuses mainly on the environmental aspects, but the social aspects are covered as well. The only thing I did not like 100% is that sometimes the author focuses too much on the environmental side, covering even the smallest details of rock composition, plant water consumption, etc. and I would have like to hear more about the social-economic aspects; but I am a social scientist, so my bias in this area is obvious.